Pray for me, and I shall for you and all your friends, that we may merrily meet in heaven. Saints alive! It’s that day of the year again, when we collectively honour that large company, the friends of God. 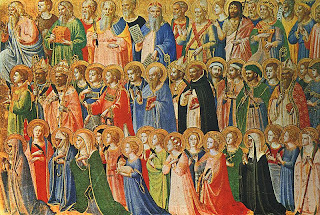 There is a more restricted notion, which holds the saints are the elect in heaven. A more expansive one includes the living who are holy, as when St. Paul calls out “to the saints, who are at Ephesus” at the beginning of that famous letter. So while today we collectively honour the canonized, we may also reflect on the living who have been saintly influences during our lives. There are those who get a head-start on the road to intimate friendship with God. They may become known or remain hidden. They may also be completely ordinary in most other ways. But they are people who are sent to help us along the way to our heavenly goal. At my house in Rome, there was a reproduction of a medieval painting that depicted men and women climbing a mountain in single-file. It represented a key aspect of the communion of saints: that we are generally drawn to conversion, or to vocation, or to growth in Christ, by the witness of a particular human individual. Granted, there may be several such figures in our lives, but often it is (or will be) the catalyst of a single person that proves decisive. I will not mention who that might have been for me, for it’s not that important. Who has it been for you? St. Thérèse of Lisieux famously promised that she would spend her time in heaven doing good on earth. I suspect that there is, more often than not, an earthly counterpart to our advocates in heaven. We know that most of God’s plans come to pass in sacramental and incarnational ways, that is, through the agency of created persons. And so, just as God may have provided someone to lead the way up the mountain for us, we too may be honoured by the same role: stretching out a hand to clasp the hand of another. And so the hallowed company makes its way towards the heavenly Jerusalem. We belong to the communion of saints, insofar as we are friends of God. And since “the friends of God are friends of mine”, we reach out to the saints in prayer. We can have relationships with them – why not – after all, they are alive even though they happen to be dead. They are more alive, in fact, than when they were passing through this relatively speedy mortal span. 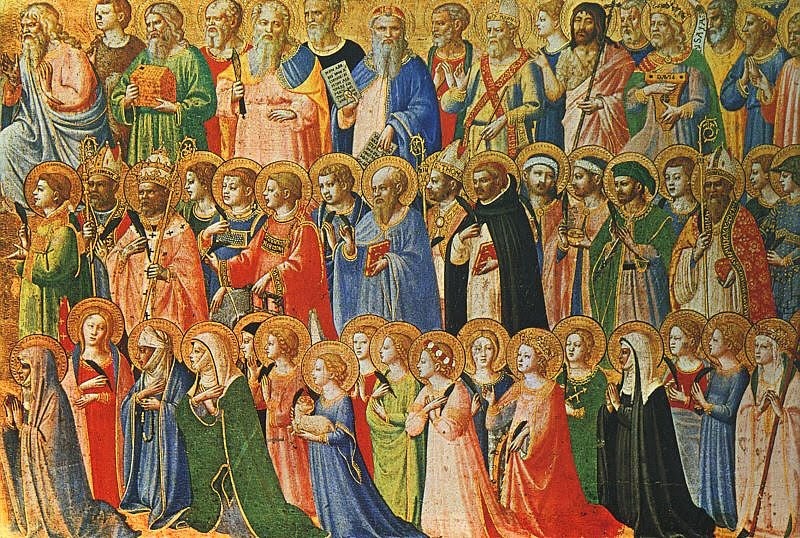 So to the saints, I say, living or…living, a happy feast to you all.